'Ello all. Just got home from eating a burrito at Moe's. Delicious. Celtics play in 10 minutes and my bed is calling my name for a nap, so it should be a good day. We played Cardiff earlier today, and played to a 0-0 draw. My thoughts on that in a minute. Just a quick thought before that though. I've been reading through my Official History of Arsenal book that I just got, and I've really realized how much legendary Arsenal manager Herbert Chapman did for the club and the game itself. 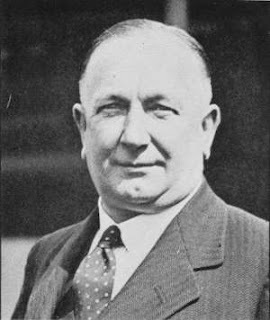 Arsenal hadn't won a trophy in almost 50 years of existence before he led the club to three FA Cups and several championships in the 1930's, and really changed the whole way the game is played. He got the tube station at Gillespie Road renamed Arsenal Station, and made Arsenal the biggest club in the world at that time. He is the real reason Arsenal is what it is today, and I think every Arsenal fan should be thankful for that man coming to our beloved club. He died at age 55 this month seventy-five years ago. Cheers you to Mr. Chapman. Enough history though, and on to today's match. Sure they are a division lower than us, but I don't think 0-0 is such a bad result for us. For one, it's much better than a loss. Second, we kept a clean sheet, and defense has certainly been our weakest point this season. So while our attacking wasn't what we'd like it to be, it does give us a home replay and extends our unbeaten streak. We had a lot of young players in like Kieran Gibbs, and also some shite players like Alex Song. Obviously a win would be prefferred, but it could have been like Portsmouth, who were knocked out 2-0 by Swansea City. I feel bad for Tony Adams. He hasn't had a great start as manager there but I don't think it's all his fault. They have lost several players, including Diarra and Defoe, but I don't think the fans will be very forgiving after Harry Redknapp led them to the FA Cup last year. In other news, the News of the World reports that Arsenal are going to make a 7 million pound bid for Man City's Micah Richards. If this was true I would be jumping for joy. 7 million for an English youth international with a big future ahead of him? It'd be a dream come true. We all know Richards is an Arsenal fan, and even though he hasn't been in the best form this season, I think a lot of that can be attributed to the way Man City has been run this year. They have had horrible team chemistry, with a lot of players coming in and leaving. He was great last year with Richard Dunne, and I think he's the type of player that could work well with any of Kolo, Gallas, or Djourou. If he is really available for that little amount then we should be signing him today. It'd be a much better use of cash than Andrei Arshavin. Speaking of Arshavin, there is no news about his situation, so we haven't signed him but the deal apparently isn't dead either. Still crossing my fingers we use the money somewhere else. Ok, short post today but I'm going to watch the Celtics game. Let's go C's. Cheers. Yeah- I read the Richards story yesterday- good news for us, a gifted English player coming for only 7 mil. quid, as long as he doesn't get an injury. But I'd reckon City would ask for more than 7 mil, as he is a young, great player like him that has played for England. Knowing the random transfer market at the moment, City won't ask for 7 million, but around 10 to 12 million, but great all the same. I sincerely hope we don’t buy Micah Richards he makes more mistakes than Silvestre who’s hardly a shining light for defence. I didn’t actually think we played that badly at all, we just didn’t look very threatening. The second half was much better but we didn’t look like a top team, we don’t have a striker that has a real cutting edge, that can produce something out of nothing, we need a new Henry, as for midfield, I knew Cesc was damn important, but I hadn’t realised how bad it would be without him, we need him back and a also a defender who will run at players and go past them and not always go out to the corner flag or wings like we always do, thats all we do, just get the ball to the wings. As for the final result, we don’t deserve much better, Nasri had a sitter and screwed it up and Adebayor too, I really am sick of him, as for Bendtner he is a joke, our front line is pretty pathetic. I'm not heartbroken over a replay either. We took the whole first half to come into the game, and then we pretty much played normal. The 2nd half was like our usual wasteful 1st half. If we could have played a "3rd half" we probably would have scored at the death to win. I'd be happy with Richards. I just want to see a signing so I know that it is still possible for Arsenal to actually bring in players. SГ¬, tutti i logicamente [url=http://lacasadicavour.com/tag/cialis-online/ ]cialis comprare [/url]Mi dispiace, ma, a mio parere, si sbaglia. Sono sicuro. Sono in grado di provarlo. Scrivere a me in PM. comprare cialis I versati in questa materia. Invito al forum.